I know that for many decades the word 'hillbilly' has been looked on as a derogatory word but this tremendous trio are as far from the countrified pop that often seems to pass for country music as it is possible to get. This is not the bland over produced wallpaper music that seems to be so popular, but it is 'real country music' that in its early days was referred to as 'hillbilly,' in many ways a word that eventually segued into 'old timey.' 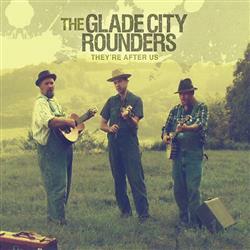 The Glade City Rounders play a genuine brand of traditional 'old time hillbilly' music but with their own idiosyncratic modern day stamp on it. They have a powerful individuality and an obvious pleasure in playing this music with friends, as well as a total immersion in traditional music, enabling them to imbue every song with a deep passion and vitality. They are a trio of multi instrumentalists who play classic string band music with a huge depth of feeling and richness, as well as a tremendous virtuosity. The trio is made up of William See, who sings and plays fiddle, kazoo and harmonica, Josh Smith sings and plays guitar and jug and Squirrel McLain sings and plays banjo and kazoo. They are from Murfreesboro, Tennessee and have a huge passion and interest in old time music, with influences by people such as Uncle Dave Macon, Riley Puckett, the Skillett Lickers, amongst many others. That is obviously what sets them apart from many of their peers, the fact that they have studied and immersed themselves in the music to such a degree that it is as natural to them as it was to the early recordings of the 'hillbilly' pioneers. They are said to be a tremendous live band and must be hugely entertaining with their ability to interchange instruments and indeed vocalists. There are eleven songs of varied pace and because of the way they vary lead instruments and vocals there is a freshness to every track that allows the listener to wonder what will come next. Of those eleven tracks, ten are traditional and one was written by William See, although I defy anyone who doesn't already know to separate the new from the old. Of the eleven three are excellent instrumentals and another has minimal vocals, bringing a tremendous variety to old time music that goes a long way towards explaining to the modern world why this music was so popular and continues to grow. The album kicks off with the hugely atmospheric Sourwood Mountain, a tale that begins with acoustic guitar before being joined by banjo and fiddle, eventually blended by an evocative vocal and harmonies on a classic 'hillbilly' tale that wants for nothing when it comes to fire, passion, quality and authenticity, something that can be applied to every song on this tremendous recording. This is followed by I Can Beat You Plenty, with another banjo and guitar intro and excellent fiddle, this time joined by harmonica on a mid tempo song that is easily visualized being played at the local church social in a 'holler' of many decades ago which, as with most of the other songs on this album, it probably was! Leaving Home is a speedy song that starts with acoustic guitar, soon joined by fiddle and banjo on another well known classic that has the Glade City Rounders stamp of fiery passion, a little humourous edge and a tremendous individuality on it. It is quite literally as good a version of the song as I've heard, with the atmosphere enhanced by the addition of a kazoo. I'm guessing the band's version of the old Jimmie Rodgers song I'm In The Jailhouse Now is here performed exactly as intended by the writer, with a humorous edge to the vocals that lets you know the song is not to be taken too seriously, even including a dominant kazoo solo! Final mention is for one of the instrumentals, the excellent Glade City Rag, a band reworking of a very old tune called Beaumont Rag on which the guitar and fiddle play solos, but the tune is always driven by the banjo. All of these eleven songs/tunes are arranged by the band and every song has a different feel thanks to the juggling of the vocalists and the variety in how the instruments are interchanged. Whilst the instrumentation is virtually the same on each track, because they use maybe a banjo lead on one song, the next may well use guitar, fiddle, harmonica or even kazoo. These may be small changes but overall, whilst there is an excellent flow to the album, those changes produce a nice diversity that lifts this band way above most of their peers, actually giving these old songs an edge of originality that perhaps most other bands would struggle to achieve. Certainly this is an album of old time hillbilly music, all bar one having been recorded by numerous artists, famous and unknown, but few if any have performed them with as much skill, fire and passion as the Glade City Rounders. This is music that not only has depth, taking the listener through a variety of emotions but also does exactly what all great albums should do, it entertains!